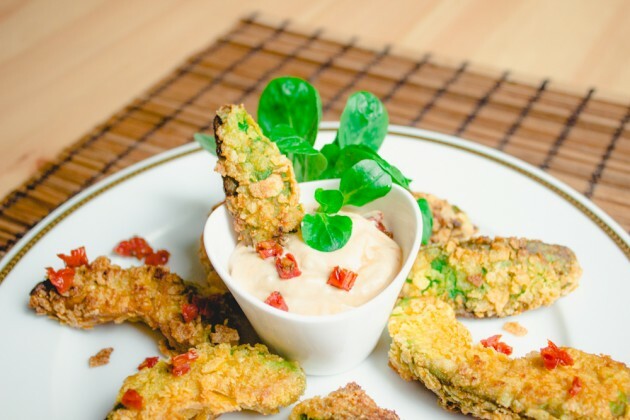 Vegan Crunchy Avocado Sticks Recipes: "Avocado should not be heated"-it echoes everywhere through the Internet. A wisdom at least as old as the Internet is also: You should not always listen to the Internet. This was recently proved by a restaurant in Mexico, where I spotted avocado in a batter on the menu. 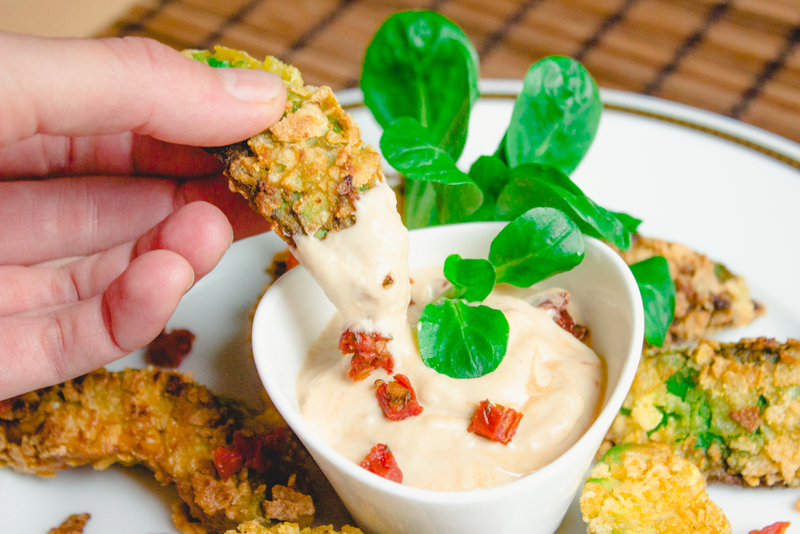 I was then wasting, among other things with a lot of thoughts of crispy coated avocados. The recipe was tasty but not perfect yet with different cornflakes and breadcrumbs. This morning I went directly to the kitchen and changed the version yesterday. Optional: colorful pepper and chili or cayenne pepper, coarsely ground. Halve the avocado and remove the kernel. Cut the halves into four thick slices each. The easiest way to do this you can see in the picture. 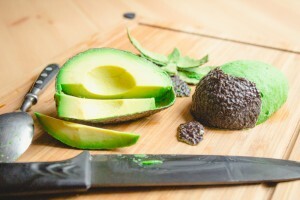 While the bowl of ripe avocados can often be removed well with the knife you can also get a result that is at least as good. For this, you simply cut the avocado slices in the bowl or right up to the throat. 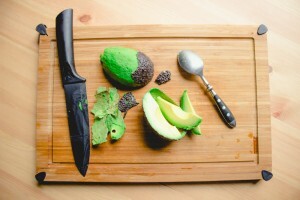 Then gently pull a spoon along the outer edge of the avocado and gently loosen the slices. Even if it is not important for the recipe today, it should be mentioned that in this way you can cut avocado cubes within seconds. (The slide for this more often, of course, crosswise as well as longitudinally) carve. I always cut my avocados like that because it not only saves time but also leaves less dirt in the kitchen. Put soy flour, cornstarch, salt and optionally pepper and chili in a bowl and mix well with the water. Crumble the cornflakes and place them separately on a plate. Carefully roll the avocado slices one after the other in the soya flour-water mixture and then in the cornflakes. Press the latter lightly. Then heat the oil. For this, you can either put a lot of oil in a pan and fry the avocado slices on both sides or fry them directly into more oil (and in a small pot). 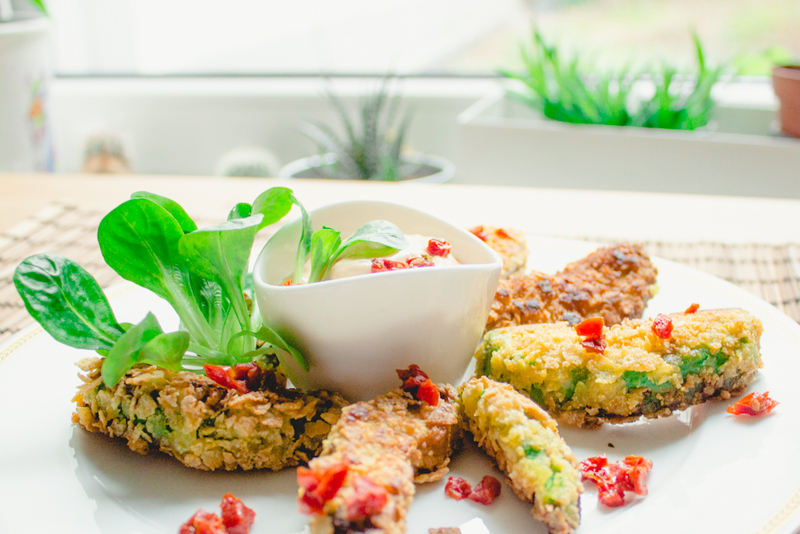 However, as avocados become bitter with prolonged frying/heating (and of course you want to avoid soaking up the bread with too much oil), you should make sure that your oil is really hot so that the breadcrumbs are crispy and the avocados do not fry too long. Remove the finished avocado sticks from the pan/pot and drain the excess onto some kitchen paper towels. Best to eat warm. Serve with a dip. This is good for example chili sauce, a lime-chili salsa with coriander or hummus.